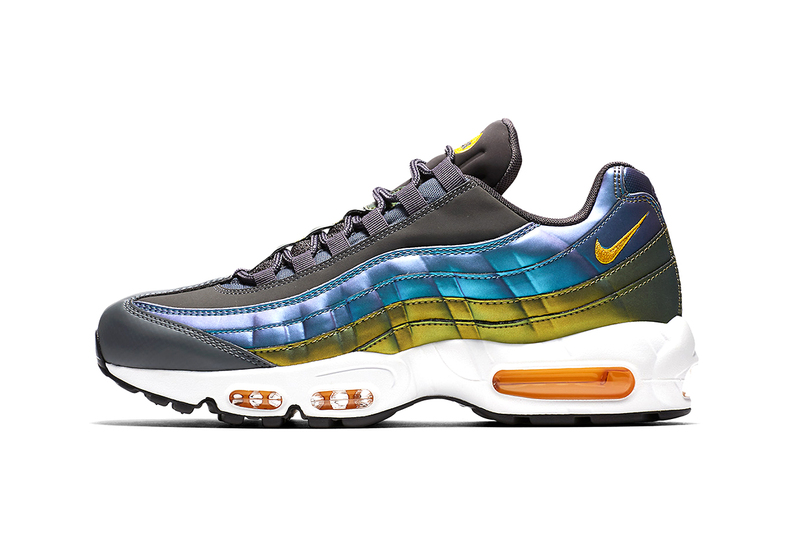 Continuing to experiment with convention-defying materials and audacious color schemes on the its best-selling models, Nike now gives the Air Max 95 a nacreous makeover. Four pearlescent, wavy overlays embellish the sober, slate grey upper. An iridescent blue dresses the upper two while the others feature a lustrous gold. Pairing with the debossed “Nike Air” motif, a golden yellow Swoosh insignia adorns the heel whereas the tongue tab is detailed with bi-colored branding. Rounding off this iteration, the white midsole contrasting with the black outsole, houses the translucent orange Air unit. The nacreous Nike Air Max 95 will be released in the coming weeks on Nike.com and at select retailers. Stay tuned for more details of the official drop date.